I would like to thank Chairwoman Gaer and other members of the commission for your tireless promotion religious freedom around the world. I’d also like to thank this commission for its tremendous commitment to the topic of today’s hearing, the crisis in Sudan. Your efforts have helped build and sustain U.S. leadership to end the devastating 20 year civil war, and for that you should be very proud. My testimony today will address threats to the agreement that ended that brutal war—Comprehensive Peace Agreement (CPA). However, I want to focus my remarks on the significant opportunities available right now not just to implement that agreement, but to achieve a lasting peace for all of Sudan, including Darfur. The stakes could hardly be higher. If the CPA unravels, there will be no chance for peace in Darfur, and if Darfur continues to deteriorate, the likelihood increases dramatically of a return to what was—for 20 years—a far more destructive war in the South. The situation is certainly dire, but deep crises can present distinct opportunities. At present, I believe there are three crucial opportunities the United States must urgently seize to prevent Sudan’s slide into full-scale war. First, the move by the International Criminal Court against Sudanese President Omar al-Bashir has finally given real leverage to force a behavior change in Khartoum. A real threat of criminal prosecution goes well beyond the harsh rhetoric and empty threats that have characterized the world’s response since 2003. The second opportunity is the growing prospect of an inclusive peace process for Darfur, one which should be modeled upon the successful example of the U.S.-backed CPA. The third is the countdown to national elections in 2009 and a self-determination referendum for southern Sudan in 2011, which is pushing CPA implementation higher on the foreign policy agenda and concentrating minds in the U.S. and elsewhere on preventing a return to war. I want to be very clear that the United States cannot do this alone. Robust diplomatic efforts are needed to increase international cooperation on a comprehensive solution to Sudan’s long crisis. In particular, the United States must seize upon the potential return to war in southern Sudan as an opportunity to engage China constructively on the CPA and on Darfur. China has $8 billion invested in Sudan’s oil sector, mostly in the South, and if Sudan returns to war,rebels have told me they will target oil installations. If China wants to protect its investment, it is in Beijing’s clear interest to work with the U.S. to forge a peaceful solution in Sudan. The situation across Sudan ranges from perilous to catastrophic. The CPA is under serious duress: the destruction of Abyei town, increasing militarization in the Nuba Mountains, and lackadaisical progress on election preparations all raise serious concerns about the durability of the agreement. 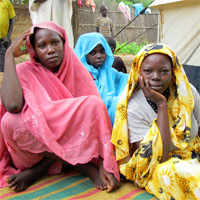 In Darfur, the violence and humanitarian situation have been deteriorating steadily for the past several months. Citing increased insecurity, the U.N. World Food Program recently announced that it could halt food shipments to some areas of Darfur just when displaced persons are most in need. U.N. member states continue to sell sophisticated weaponry to the Sudanese government, whose forces have recently launched a new offensive against Darfur’s rebels. The Sudanese government has attacked international peacekeepers and, in yet another perverse twist, is mounting a new offensive strategy centered on direct military attacks against the desolate camps that are home to Darfur’s displaced civilians. Yet today, at the U.N. General Assembly in New York, governments from around the world are pressing to suspend the International Criminal Court case against Sudanese president Omar al-Bashir. Diplomats from the African Union and Arab League, and even ICC supporters such as France and the United Kingdom, have suggested that holding war criminals to account in Darfur could derail efforts to end the crisis and achieve full implementation of the CPA. They couldn’t be more wrong. Should efforts to suspend the ICC case succeed, the implicit message to President al-Bashir will be that he can continue to pursue a military solution to Darfur and obstruct implementation of the CPA at will. Such a scenario threatens the future of Sudan’s very existence as a state. There are several key opportunities the United States must seize (and work multilaterally to encourage others to follow suit) in order to capitalize on the Sudanese government’s incentive to make a peace deal before a new U.S. Administration takes a harder line with Khartoum. Taking advantage of these opportunities, the U.S. can make progress now on two crucial issues: full implementation of the CPA; and forging a credible peace process in Darfur. Article 16 of the Rome Statute, the charter that established and governs the ICC, enables the Security Council to suspend an ICC investigation on a one-year renewable basis—if such a move is deemed in the interest of peace. The Sudanese government’s preoccupation with the ICC charges indicates that Bashir and his inner circle view international justice as a serious threat, and the actions of Chief Prosecutor Luis Moreno Ocampo have given Bashir a vested interest in reaching a peace deal in Darfur and actually implementing the peace deal achieved between north and south in 2005. Recent history makes it clear that Khartoum changes its behavior only when faced with tangible penalties. In three instances—Khartoum’s cooperation in the “war on terror,” its suspension of support for slave-raiding, and its willingness to negotiate an end to the war in southern Sudan—the regime shifted policy because its diplomatic adversaries drew a line in the sand. Unfortunately, the full court press by Sudan and its allies in the African Union and Arab League to suspend the investigation has been accompanied by weak knees in Paris and London, placing the United States firmly in the driver’s seat at the United Nations Security Council. In late August, U.S. diplomats met in London with their British and French counterparts and sent an unambiguous message that, absent significant behavior change in Khartoum, the United States would block an Article 16 resolution in the Security Council. As a permanent member of the Security Council, it is up to the United States to set clear and non-negotiable benchmarks that the government of Sudan must meet prior to any consideration of Article 16. These should include a peace agreement for Darfur, dismantling government-backed militias, unrestricted deployment of a more effective peacekeeping force to Darfur, and full implementation of the CPA. To date, the Sudanese government has made no credible progress on these major benchmarks. In the immediate aftermath of the ICC warrant request, President Bashir rallied to his defense many disparate elements from inside and outside Sudan. From Sudanese opposition parties, to reliable protectors like China and the Arab League, to unfortunate allies like South Africa and Rwanda—all expressed support for a suspension of the ICC investigation through Article 16. But this wagon-circling will not last long. By establishing a timetable for elections, the CPA seeks to give Sudanese citizens more control in how their country is governed. National elections are scheduled for 2009, and in 2011, the CPA allows southern Sudanese to vote on whether to remain part of a united Sudan, or pursue self-determination. The question for southern Sudan is a simple one: Why would we want to remain as part of Sudan? Khartoum has yet to provide a compelling answer. However, there is the real possibility that Khartoum would launch another war to avoid letting southern Sudan exercise its peace agreement rights to vote for secession. With the clock ticking, all actors—Sudanese and international—have strong motivations to prevent this nightmare scenario. Sudan’s most powerful backer, China, has perhaps the greatest incentive to avoid a wider war. A sober analysis of China’s economic interests in Sudan leads to an inevitable conclusion: The cost of a full-scale war in Sudan cannot justify China’s unwavering support for the National Congress Party. The bulk of China’s $8 billion investment in Sudan’s oil industry is concentrated in southern Sudan, and rebels there will almost certainly target Chinese oil installations should there be a return to war. Seen in this light, China can only protect its investments by working to avoid a return to war and to encourage full implementation of the CPA. If pragmatic heads prevail in Beijing, an unlikely partnership between China and the United States could be possible. The parties and the guarantors to the CPA promised to “make unity attractive” for all Sudanese, but the deeply engrained mistrust, the death of SPLM leader John Garang, the NCP’s response to Darfur, and slow implementation of the CPA have done just the opposite. The CPA guarantees southerners the right to independence from the North, and the international community has an obligation to support the will of the southern Sudanese. Opinion polling indicates that southern Sudanese will vote overwhelmingly for independence if given the chance in 2011. Nothing concentrates the minds of diplomats like the possibility of a new state, and it is clear that the international community is now on track for a crisis in Sudan even larger than that of Darfur. A comprehensive approach to power-sharing remains the only way the international community is likely to avoid a prolonged and bloody war that will engulf most of Sudan over time. The international community is consumed with the possibility of an ICC arrest warrant for President Bashir and the lagging pace of UNAMID deployment. However, the key to lasting peace in Darfur is an inclusive peace agreement that ends the conflict and allows displaced persons to return safely to their villages and rebuild their lives. Illustratively, at a meeting of former U.S. secretaries of state last week in Washington, D.C., that was broadcast this weekend on CNN, our most senior diplomats sparred over the U.S.’s obligation to intervene militarily in Darfur and, given deployments to Iraq and Afghanistan, our ability to do so. Scant mention was made of the need for a credible peace process. Not surprisingly, the Darfur peace process is in shambles. Enough and its partners in the advocacy community have long argued that a viable peace process for Darfur should draw from the model used to negotiate the CPA: regional mediation supported by senior diplomats from countries with leverage over the parties. Current negotiations have been stalled for months for a number of reasons, not the least of which is the United States’ stubborn insistence that the failed Darfur Peace Agreement, or DPA, is the road map for peace in Darfur. Now it appears that the only rebel faction to sign the DPA—the SLA group led by Minni Arko Minnawi—may be on the verge of disavowing the deal. This would force the international community to get fully behind a more inclusive new process. And there is more good news. The United Nations and African Union took action in July to address the inadequacies of the peace process by appointing Burkina Faso Foreign Minister Djibril Bassolé as the single mediator for the Darfur peace talks. The U.S. must lead the international community in providing Bassolé with the resources he needs—a full-time team with expertise in all of the relevant issues under negotiation, backing from a group of countries with leverage on the government and the rebels, and strong support from the Security Council—so that he can construct a new negotiations process that has a real chance of success. The conventional wisdom about Darfur is that the splintering of rebel factions has resulted in a vacuum of political authority and the absence of a viable Darfurian interlocutor for peace negotiations. However, this analysis wrongly assumes the rebels to be Darfur’s only representatives. Indeed, the many failed attempts to negotiate a settlement to the crisis all lacked inputs from one of the most important stakeholder groups: the people of Darfur. Darfurians have responded, and in recent months the efforts of civil society groups inside Sudan and in the Diaspora have begun to bear fruit. In the United States, a wider umbrella of Darfuri organizations that calls itself the Darfur Leadership Network, or DLN, has worked with several organizations (under the auspices of the Save Darfur Coalition) to establish a platform that, if adopted by a broad group of stakeholders, will consolidate these efforts around a single road map for peace. My good friend and colleague Omer Ismail from Enough is here today and has been closely involved in these extraordinary efforts. A credible peace process must address both the local and national issues that underlie the conflict, ensuring that resolution of the conflict in Darfur complements full implementation of the Comprehensive Peace Agreement that ended the conflict in southern Sudan and that provides a blueprint for the democratic transformation of the entire country. Activists have increasingly recognized that Darfur cannot be saved without a solution to the problems of Sudan. But it is just as important to recognize that full implementation of the CPA cannot be achieved without a peace agreement in Darfur. It is up to the U.S. to lead the way forward on the peace process in Darfur and full implementation of the CPA. The U.S. must refocus the international community on the opportunities present today in Sudan, instead of dwelling on the flat-lined DPA and making incremental improvements to the fundamentally flawed UNAMID. The Bush administration is entering lame duck territory, but the Sudanese government is acutely aware that neither Senator Obama (D-IL) nor Senator McCain (R-AZ) will take a softer line on Darfur or the issue of southern Sudan. Quite the opposite: Both McCain and Obama have advocated NATO enforcement of a no-fly zone in Darfur, and Senator McCain has discussed the right of both southern Sudan and Darfur to self-determination. In addition, McCain has raised the possibility of providing southern Sudan with air defense systems if it splits from northern Sudan. In short, Sudan’s government has more incentive now to make a peace deal than ever before. If events continue on the current track, both the Sudanese government and the international community are headed for an escalating military confrontation. The huge opportunities for peace must be acted upon before it is too late for millions of Sudanese people.